Gebekse Koyu lies by İnceburun Peninsula, between points; Akyar Burnu and Çiftlik Adası. 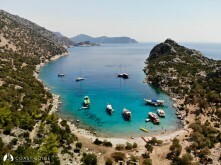 İnceburun Peninsula is connected to shore with a narrow isthmus and extends to the E for about 0.5 M and protects Gebekse from breeze. The depths in the bay gradually shelve ashore. The bottom is weed at the entrance and becomes clear sand. Boats can be pushed off or anchored with a line ashore. Gebekse Koyu affords sheltering from breeze. The slopes are covered by olive trees. The ruins ashore are from Byzantine era. 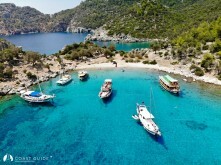 This anchorage gets crowded by the tripper boats from Marmaris, but it is quite after 16.00 pm.